This week at our line time we have started singing about our "place" in the world using one of my favorite songs to introduce geography to children. I used to sing this with the children in the Montessori school where I taught previously and am excited to introduce it to my new "crop" of students. This time, my friend, Amber, allowed me to borrow a perfect book which I am using to introduce the song. It is called Me on the Map. I am including a photo of it below and will add it to the Amazon link on the sidebar. I like to involve the children in the songs as actively as possible using props. 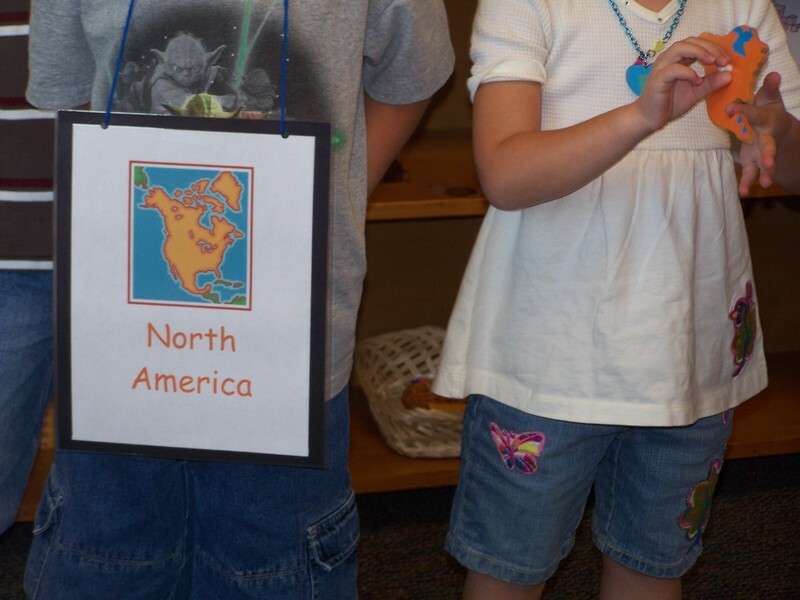 When I did this song before, I had made up necklaces to represent each geographical area of the song. The children wore these during our singing. Of course I didn't have the foresight to take the necklaces with me, so I had to make new ones from scratch. Since I have 20 students in each session, give or take, and there are 5 geographical "concepts" in the song (planet, continent, country, state, town), I decided to have a necklace and "prop" for each concept. That way we could sing the song twice and every child would have a turn to do a special job. Below you will see photos of the necklaces and props. I have typed the corresponding song lyrics under each photo. The tune is "He's Got the Whole World in His Hands." The "necklace" is pictured at left. I took this photo before I punched two holes in the top and tied a piece of yarn through the holes. Here are the lyrics for this verse. 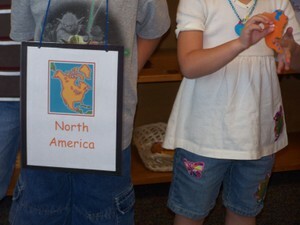 One child would stand in front of the group wearing the necklace while another child holds the globe. "I live on the planet, the planet Earth, (repeat twice), I live on the planet Earth." 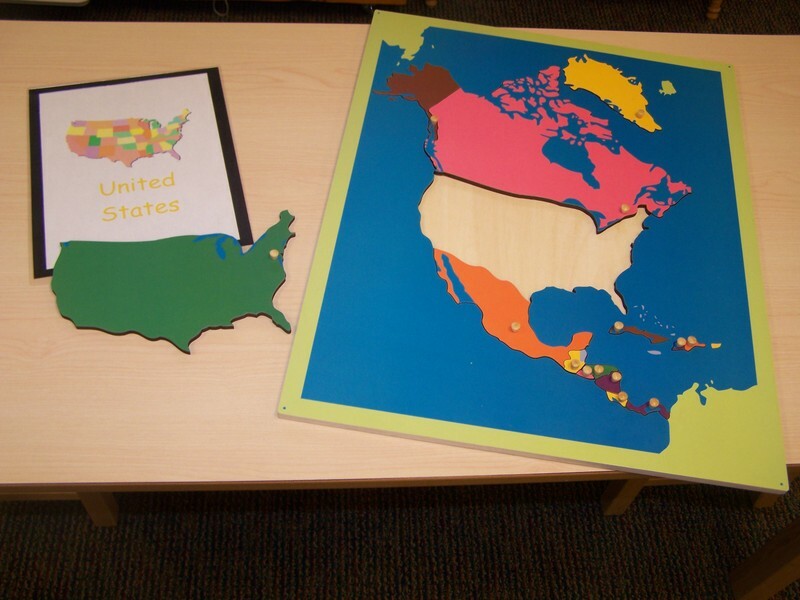 For this verse, one child wears the necklace and one holds the "North America" piece (it's orange) from our world puzzle map. "I live on the continent of North America, (repeat twice), I live in North America." For this verse, one child wears the necklace and the other holds the United States piece from our North America puzzle map. "I live in the country of the United States, (repeat twice), I live in the United States." 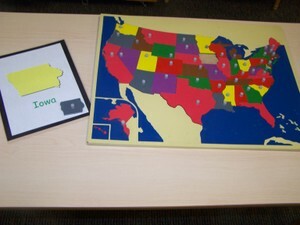 For this verse, one child wears the necklace and the other one holds the puzzle piece for our state, Iowa, from the United States puzzle map. "I live in the state of Iowa, (repeat twice), I live in Iowa." For the final verse, the necklace is identical to the one pictured above, however, our town is marked with a dot and labelled. One child wears the necklace and the other holds a stuffed animal representing our high school mascot (or they yell, "Go Rams!"). "I live in the town of _____________, (repeat twice), I live in ____________." I took this photo today so you could see one friend wearing the North America necklace while the other friend held the North America puzzle piece. 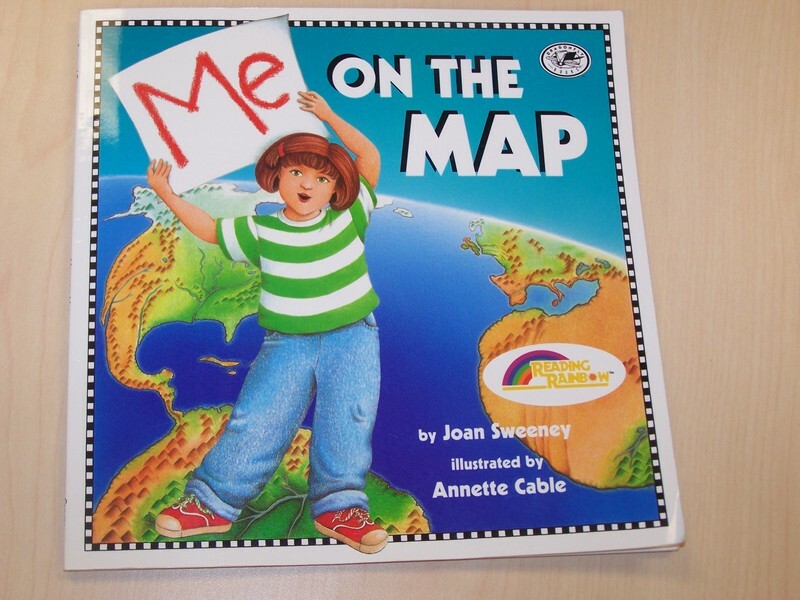 Of course this song could be adapted to sing about your specific place on the globe. 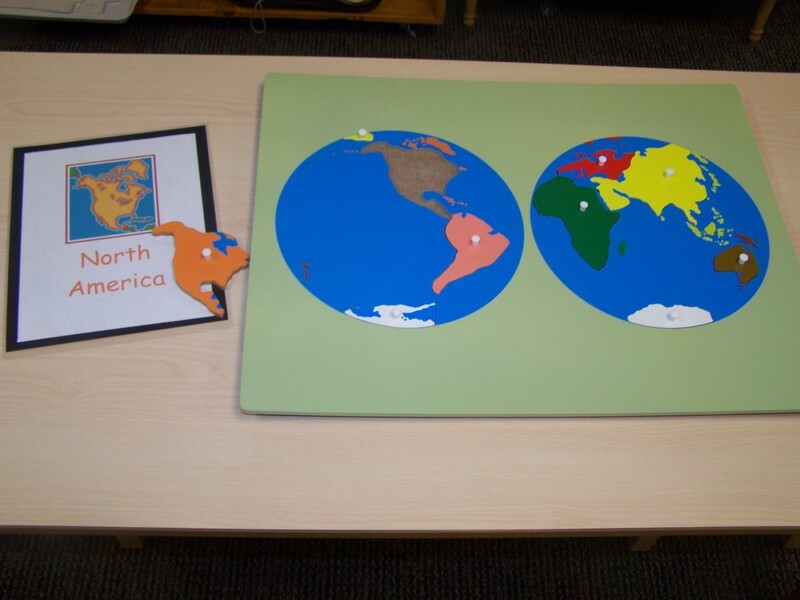 Even though geography is still an abstract concept for many preschoolers, I love how this activity makes it more concrete and plants the seeds for understanding that will come later. Home to millions of species, including humans, Earth is the only place in the Universe where life is known to exist. The planet formed 4.54 billion years ago, and life appeared on its surface within a billion years. Since then, Earth's biosphere has significantly altered the atmosphere and other abiotic conditions on the planet, enabling the proliferation of aerobic organisms as well as the formation of the ozone layer which, together with Earth's magnetic field, blocks harmful radiation, permitting life on land. The physical properties of the Earth, as well as its geological history and orbit, have allowed life to persist during this period. The world is expected to continue supporting life for another 1.5 billion years, after which the rising luminosity of the Sun will eliminate the biosphere. 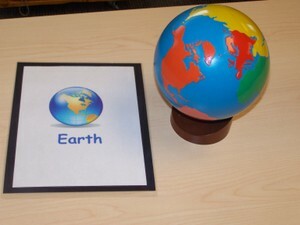 You are so full of great earthday ideas!!! Thanks for the song and idea! My kiddos love he's got the whole world in his hands....the will love this. 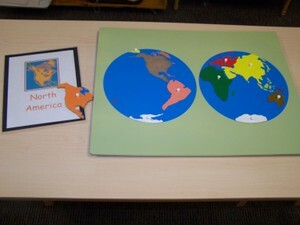 Hi I love your blog and I have recomended it to many Mom like me that home school their children. And their comments are fantastic, keep the good work. I love this book, I also use it a lot, but I wish they would make a Canadian one! I like your adaptation for the children! This is so simple and so well thought-out -- thanks for sharing with us!